When I was a preteen, "Girl's Life" magazine was my publication of choice. I'd sneak peeks at "YM," "Seventeen" and "Sassy" at the local library, but "Girl's Life" was the magazine I asked my father to pay for at Barnes & Noble. It also happened to be my first real foray into cooking. One of my last issues of "Girl's Life" featured a summer picnic cooking theme, and for some reason, the potato salad screamed out to me. I approached my mother and asked her to help me gather the ingredients necessary to make the salad, and it was every bit as delicious as I'd hoped it'd be. And then I lost my magazine. It wasn't until I moved last year that I discovered the recipe again. I had ripped it out and placed it with out sentimental magazine rip-outs. 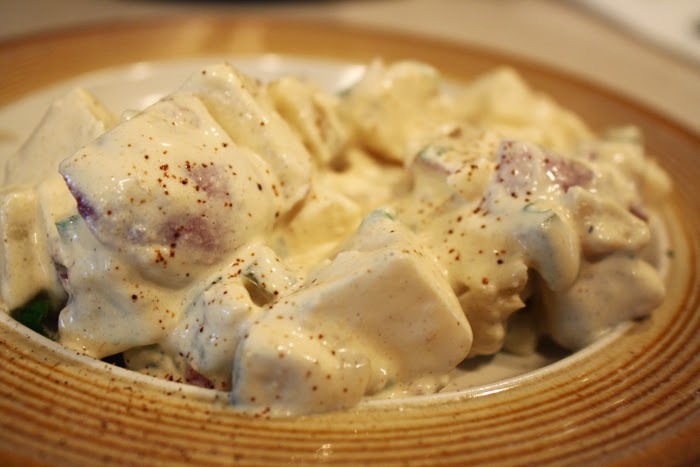 Recently I decided to make this potato salad again, after about 15 years, and it was still just as great as I remembered it. I did, however, alter the recipe as I'm sure I did the first time around. The original recipe calls for shredded carrot and parsley, but I find that the flavor of the two a bit too overwhelming to be paired with the rest of the salad's flavors. It's so simple, but to this day, this is still my absolute favorite potato salad recipe. 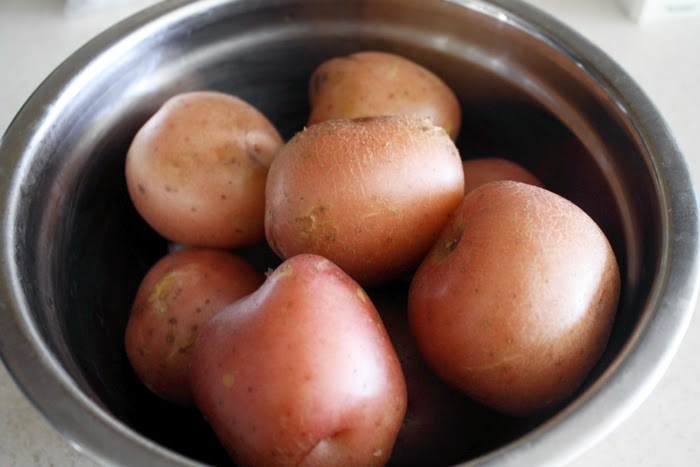 Place the potatoes in a large pot and cover with water. Place lid on pot and simmer on medium heat for 20 to 30 minutes, or until the potatoes are tender (when a fork can be easily inserted into them). Remove the potatoes from the pan and refrigerate until they are cooled. 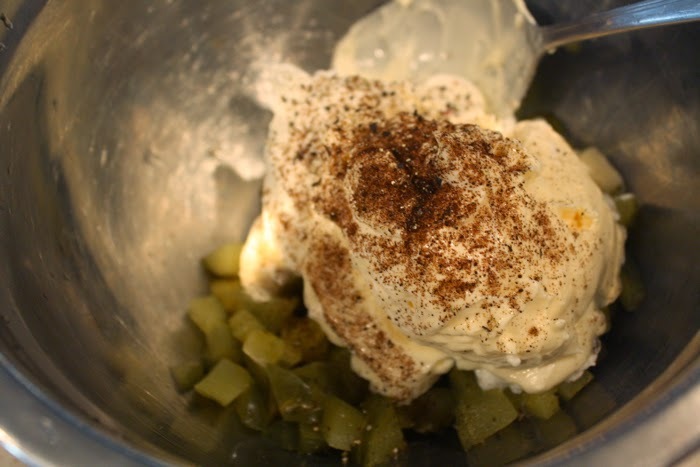 In a large bowl, whisk together the "dressing" ingredients: yogurt, mayonnaise, mustard, lemon juice, relish, a dash of cayenne pepper and ground pepper to taste. Trim off the ends of the green onions, chop, and add to the bowl. 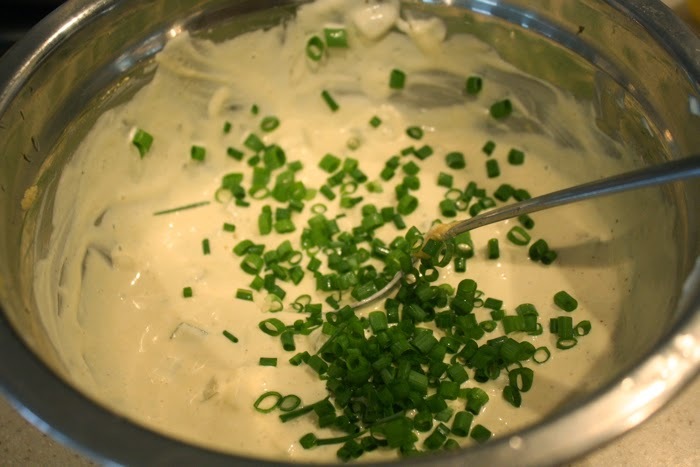 Cut the potatoes into one-inch pieces and add to the dressing. Stir carefully with a wooden spoon, chill, and sprinkle with paprika just before serving, if you'd like.